Valley Life for All is building inclusive communities, one voice at a time. 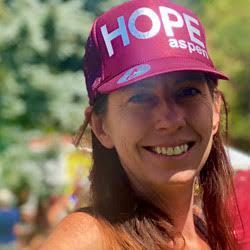 Christie Henderson moved to Aspen in 1999 for the ski season and never left. Her compassion for mental health began in June of 2015 when a friend made a call to the HOPEline (1 - 970 - 925 - 5858) and she credits the Hope Center with saving her life. In September 2017 she became the Outreach Coordinator. Christie shares her story openly to help others know they are not alone and it is okay to reach out.